Alaska is definitely part of the continental U.S., I should have said Arizona was first in the "contiguous" states to pass full Constitutional Carry (Alaska did it in 2003) -- no permission slip needed to discreetly bear arms. Thanks, Alaska resident Cliff E. who's tired of geographic inaccuracy, perpetually hearing from ignoramuses who say he must pay in U.S. dollars, or that a firm doesn't ship outside the U.S. So which state is next to pass Freedom To Carry -- yours? If yes, I'll get your location right, promise. It's "Don Cline" with a "C." Sorry Don. At least I spelled it two different ways in the one article. 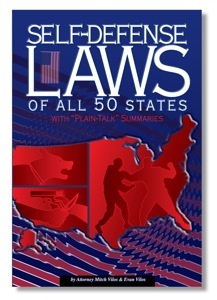 Never before attempted, a complete guide to the self-defense laws in plain English! 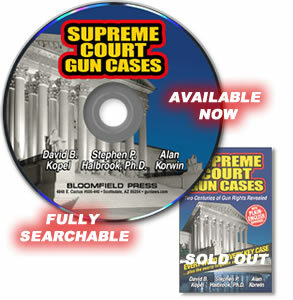 556 pages, a stunning achievement, for all gun owners, not just CCW permit holders. You've got a gun... but when can you use it for legitimate self defense -- in your state? All states are different, though basic principles apply. This book makes it clear. Just look at the Table of Contents. 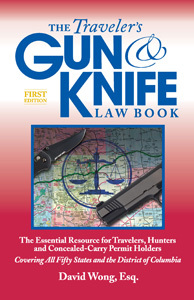 Traveler's Guide to the Gun AND Knife Laws of All 50 States! Advanced orders now being accepted (Credit cards will not be billed until the books ship out later this month). 16 New Virginia Gun Laws Enacted! The L.A. Times "Homicide Blog" since 2007 clearly shows who's getting murdered. All 740 of them. It's not "gun violence," it's social violence for one tiny class of people. Guess who. <snip> "The truth about homicide," senior reporter Jill Leovy says, "is that it is black men in their 20s, in their 30s, in their 40s. The way we guide money and policy in this country, we do not care about those people. It's not described as what's central to our homicide problem, and I wanted people to see that. I wanted people to see those lives and to see that that's our real homicide problem in America. <snip> "The money needs to go to black male argument violence," she continues. “Anything else you're dealing with the margins of the problem, statistically, and it's not right." "Homicide is not a mass syndrome in America," she says. "It's a concentrated group of people and that group of people is still horribly affected by homicide." In 2007, L.A. County's murder rates were especially low. Even so, Leovy says, black men in their 20s were dying at rates of around 140 per 100,000 per year. "As a middle-aged white lady, my death rate is probably 1 or 2 per 100,000 -- maximum," Leovy says. "These young men are dying at 140. They're in a war zone, and the rest of us are living in a different country." "The real homicide problem is not the numbers that everybody focuses on, it's the disproportion." The Times, going against their usual anti-gun-rights grain, has joined a few other courageous mainstream papers in exposing the ugly underbelly of the anti-gun campaigns waged by America's hoplophobic bigots. and help justify the law enforcement world and its budgets. and place blame where it really belongs: on the causes and people that fuel the violence we hear about (but rarely actually see for ourselves, except on TV "news"). The real blame is hidden, because the truth is so painful. Crime is not spread across the streets of America. for well-known reasons the media and politicians hide from you. to the government and away from the people. See the maps. A picture is worth a thousand words. “Crime in the U.S. dropped dramatically in 2009, bucking a historical trend that links rising crime rates to economic woes,” according to unidentified wire service reports. Extensive numerical measures of the drops for property and violent crime are provided by the FBI, with drops in the single digit range for all categories. The connection between private gun ownership and reductions in rates of crime were unexamined by unidentified wire service reports, expressing surprise that crime has dropped despite a bad economy which, according to the wires, seems backwards and is inexplicable. “Gun sales rose dramatically in 2009, as fears of a democrat crackdown on Second Amendment rights drove millions more to gun stores than in previous years,” notes the Uninvited Ombudsman. “Whether this had an effect on the crime numbers dropping seems likely, and has been well documented in the past, but cannot be proven from anecdotal FBI reports,” he said. Wire services failed to note the likely trend, preferring instead to express surprise that crime dropped. Past crime reports have more accurately indicated that arrests have dropped, since that is largely how crime rates are measured. However, crime rates and arrest rates are only indirectly linked. Get-tough enforcement programs, or budget cutting to police forces, have a far greater effect on arrest rates than anything else. Despite the media's confidence in its report, the actual rates of committed and attempted crime are essentially unknown with any precision. [Late breaking news: This bill was killed by Pelosi three days ago, but the story and aftermath remain instructive]: Democrats are seeking to pass a bill called the DISCLOSE Act, that would do damage to free speech and force powerful political groups to use big chunks of their air time identifying their donors and leaders. The bill seemed doomed, but only because the powerful gun lobby objected to such encroachment on their right to free speech. The problem was solved however when clever democrats amended the bill to let the NRA off the hook -- while keeping chains on virtually all other political-interest groups. First, recognize that a Congress that would do such a thing -- write a law that exempts one single group so the law can be passed -- is as corrupt as anything you can name. While it's good that the NRA's right to free speech is not infringed, it is an abomination that Congress would do that to any other group under any rationale whatsoever. All groups deserve the same exemptions, namely, the entire bill should die (and as noted at the beginning, it did... for now). Placing draconian burdens on political speech is tyranny. Identifying players in the political theater might be acceptable, but burdening their free speech to do so is not a legitimate option. Congress, or at least the party behind this, deserves a face slap and leg irons. In one sense though, carving out an exemption for the NRA was a good thing. In the backhanded dirty dealings of modern U.S. politics it may have been planned to get the result it did, death to the bill, by deep insiders who play these dangerous games. It showed the democrat leaders for the conniving deceitful beasts they are, and raised a firestorm against them -- not so much from their opponents, which they expected of course, but from their own members who revolted en masse! Are some politicians laughing at the morass? I sure am. One of the best things the NRA has accomplished receives little recognition and less praise. Sure, they've fixed, bolstered, introduced and enhanced laws that improve the right to keep and bear arms. Yes, they have held the forces of darkness at bay, especially at the federal level where no one else does that job with as much pull. Of course they pour support into the state associations and local battles that are crucial to preserving the Second Amendment on a practical, every day level. But the NRA is responsible for moving the public mindset, for challenging and changing the debate in the court of popular opinion, in a way all the smaller players could not. People everywhere are more accepting now that a woman is entitled to protect herself from assault. That every home owner has the right to defend the family castle. Oh, the lamestream media has been slow to arrive at these self-evident truths, but America now largely accepts the idea of discreetly carried firearms, by responsible adults, even if the Cro-Magnon media thinks of it as Cro-Magnon. Hopelessly bogus myths that our sacred right to keep and bear would lead to blood in the streets have crashed and burned. Gone is the fabricated silliness that “the right of the people” is a collective right of no one at all -- thanks in large measure to decades of NRA-supported research that led to the Heller case victory. When we look at NRA-backed individual state and federal bills that might not please us totally, we need to always see the larger picture. The constant pressure NRA brings to bear against the anti-rights bigots in society is a steamroller suppressing the forces of evil, without which our gun rights would be a pale shadow of what they are, if they even existed at all. For donors who don't want their contributions spent on campaign activity, would require the NRA CFO to certify to them in writing within 30 days of their donation that their money wasn't spent on campaign activity. P.S. A decision in the McDonald v. Chicago case (supported by the NRA, SAF, ISRA and a long list of other rights activists including Bloomfield Press), that would force states to comply with the Second Amendment, is expected between now and the last day of the session, June 28 (smart money says it will be the last statement on the last day). Taking guns away from the people will put an end to mass shootings. Don't look across the pond where "gun-free" Great Britain just had another mass shooting of unarmed helpless citizens. A gunman was stopped by an off-duty police officer, out of his jurisdiction, at Salt Lake City's open public Trolley Square in 2007. Another shooter was stopped in his tracks at a church in Colorado Springs that same year, by a woman who had her gun with her. An armed customer at a restaurant in Anniston, Alabama prevented a mass shooting in 1999. An armed high school vice principal stopped Pearl, Mississippi gunman Luke Woodham. Two armed students stopped a gunman at the Appalachian Law School in 2002. Thanks to SAF for reminding me and providing this partial list. AP--CHICAGO--Illinois Rail Chief Dies In Apparent Suicide By Train. “The executive director of Chicago's Metra commuter train service died of an apparent suicide... Pagano, 60, was on paid administrative leave at the time of his death after Metra began investigating claims that he received an unapproved $56,000 bonus... two written notes were found... 'We have no reason to believe there's anything criminal involved in this,' County Sheriff Nygren said,” according to reporter Caryn Rousseau. An official is forced out of his job, at least $56,000 is in question, in a town like Chicago where that could be the tip of the iceberg, this (and whatever else may be at play) is enough to move the guy to kill himself, and the Sheriff says there's nothing criminal suspected? And the reporter doesn't ask any of the obvious questions, she just runs the quote? And the reporterette keeps her job? In other news, a medical examiner announced on Saturday (6/14) that former ABC news anchor Ted Koppel's son, who was found dead in a stranger's apartment, died of a lethal combination of alcohol, heroin, cocaine and a variety of prescription drugs. According to the wire service report, police had said "no criminality was suspected," although heroin and cocaine were, at far as is known, still illegal. The "news" reporters asked no followup questions, or if they did, they went unreported. Gun possession and use, even when perfectly legal, is typically portrayed as if heathen miscreants living in compounds are heavily armed, but fraud suicides in Chicago and illegal drug overdoses by children of elites are reported as nothing criminal. Go figure. CLEVELAND--Judge Alfred Mackey of Ashtabula County Common Pleas Court advised residents Friday to arm themselves because the number of deputies has been cut about in half because of a tight budget. It was unclear at press time how large a force of deputies is required before citizens no longer need to arm themselves for their own safety. According to Michael Ferraresi, writing for The Arizona Republic: A federal firearms-identification database used to solve Phoenix murders could soon be expanded to other Valley cities if detectives are approved for a grant. The National Integrated Ballistic Information Network database, which cataloges weapons and helps investigators link evidence from multiple crime scenes, is touted as key technology in a major metropolitan area. Shootings in Phoenix spill into other communities and vice versa. Phoenix police enter more than 7,000 firearms into NIBIN system each year. Crime scene investigators enter the evidence as quickly as days or up to a week after a crime occurs, enabling detectives to use 3-D imaging and other technology to compare spent shell casings with evidence in the system, which spans the country. I once saw the official account of 26 firearms databases maintained by the federal government, and the justifications for each one that supposedly exempted it from the Firearm Owners Protection Act (1986) ban on such databases. It was a full-blown federal report available as a pdf file. Some of the databases were more-or-less understandable -- firearms reported stolen, guns held in evidence, accountings of guns in federal arsenals (the egg-inspector police, the print-shop police, environmental protection agency police, etc.). The NIBIN crime-incident system sounds like a new one. Are there more? I can no longer find this document, which Congress had requested as part of a watchdog effort on the FOPA Act. I am asking Page Nine readers to track this down and send me a copy or a link. I don't ask my readers for much, but in this case however, it would be very useful if someone can find that Congressional report, covering federal gun databases and the justifications for each one's existence. Thank you in advance. I'll circulate the info once I have it. Nothing. Well, FOX ran a story on it, but none of the other media did. This photo was taken by a close personal friend of mine, and it has begun to circulate. It is authentic. It is shocking. 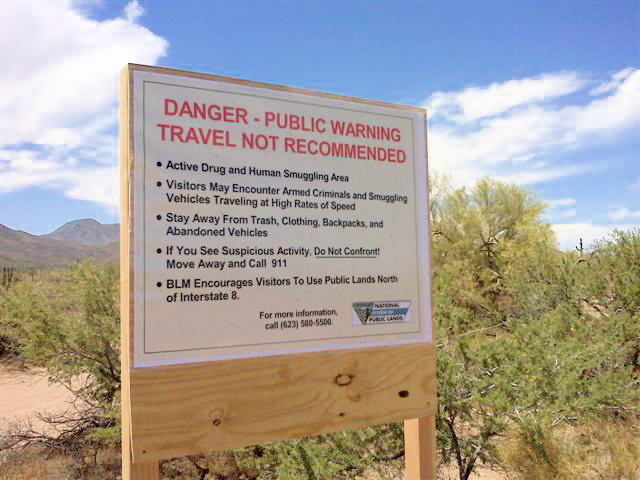 A significant portion of my state of Arizona is now posted off limits to citizens by our own government, because vicious Mexican invaders have taken over the land. While the "news" media is getting apoplectic over non-existent racial profiling on a law that hasn't even taken effect (SB 1070), designed to help curb this disaster, they stand mute while a foreign nation invades us and cedes land to themselves. Public lands south of Interstate 8 -- the land the feds have declared is no longer available to us -- is a huge chunk of the state. Where's the NY Times on this, or the networks? Senator Russell Pearce, a good friend and the co-author (with other legislators) of SB 1070, in a speech I attended today (6/19), pointed out he has met with ranchers in this area. One has endured 300,000 trespassers across his land, three stolen cars, multiple break-ins, slaughtered livestock, destroyed water lines, and he and his family live in fear with their windows and doors boarded up. When you hear that the federal government is doing nothing, know well that this is a monumental problem, not some minor glitch. We are suffering an invasion, and the feds have abrogated their duty to "protect each of them (the States) against Invasion." (Art. IV, Sec. 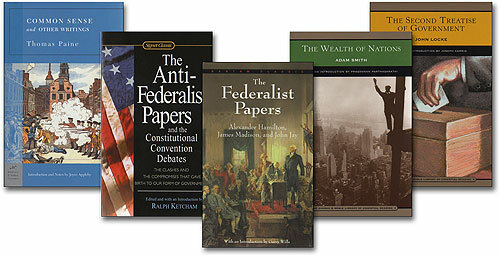 4, U.S. Constitution). Russell also complained that he doesn't like to follow me at the podium (I delivered the pre-luncheon address, at the Arizona Republican Assembly annual meeting), because I get the audience cheering and stomping and I'm a tough act to follow. C'mon, Russell, you held them in rapt attention, with total command of the facts, figures and politics of this debacle. J.D. Hayworth, who's challenging John McCain in the Senate race and was the luncheon speaker, and Andrew Thomas, the county attorney who is vigorously prosecuting captured invaders despite massive retaliation from groups within our own government, had no such complaints. I'm available to speak at your next event, if you're interested. 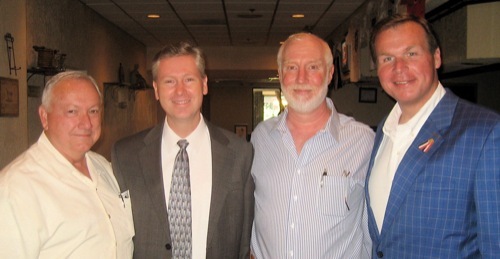 Left to Right: Sen. Russell Pearce (co-author of SB 1070), Maricopa County Attorney Andrew Thomas (courageous prosecutor pursuing illegal-alien activity), Alan Korwin (The Uninvited Ombudsman), and senate candidate J.D. Hayworth (opposing long-time incumbent John McCain), at the Arizona Republican Assembly annual meeting, June 19, 2010. Photo by Tom Jenney, Arizona State Director, Americans for Prosperity. Things are not going well for the Brady anti-rights group, as the principles of robust rights to keep and bear arms grows in America. Scare tactic myths they've spread for several decades are apparently collapsing under their own fictitious weight. To raise funds, the group is selling its mailing list, a paltry 50,000 names, many of whom are known to be pro-rights activists (like The Uninvited Ombudsman and friends) who joined, "to keep their enemies close." Previously, the Bradys claimed a million members, and absorbed the so-called Million Mom March (a misnomer) as a group under its umbrella, when that group got so small it couldn't sustain itself. In other news, Examiner.com reported on June 4 that, according to public filings required by disclosure laws, Brady had raised $1.7 million in the 2000 election cycle, but that dropped to just over $15,000 in 2008. So far in 2010 the group has raised only $2,500, which came from a single donor. "The conclusion is clear," writes reporter Rob Reed, "The public no longer believes the gun control lies." I saved the file, but now can't find a live link to the original story; I'm sure you techies can dig it out, and please accept my humble apologies for ineptitude. Allen C. complained about my skewering the bogus earthquake-predictions, saying my inferences are incorrect, and we disagree. However, he then notes that no one will remember the prediction 30 years later anyway, so the "science" prediction is worthless on other grounds, an excellent observation. Think of all the wiggle room politicians could get if they simply cast everything 30 years out! They're already testing those waters, passing a health-care takeover that doesn't come into force until after many who voted for it are out of office in 2014. P.S. I receive occasional letters like that, wishing I would stick solely to gun-related issues. Because of all my work in that field, it’s easy to overlook the fact that I’m a writer first and a gun-law expert second. Without a wide breadth of interests I would desiccate, and that would serve no one. If you look hard you’ll see the main focus of Page Nine is news-media accuracy (or the severe lack of it) across a broad range of subjects, not the gun issues my news-media watchblog frequently contains. FWIW, my bona fides include publishing (CEO of Bloomfield Press); writing and authorship (25-year track record); public relations (long client list includes Pulitzer winner Steve Benson); public speaking (AIM Speaker’s Bureau); technical writing (IBM, AT&T, Motorola, many more); business plans and proposals ($10MM+ in funded proposals); First Amendment law (next book is on limits of free speech); acoustics, audio engineering, guitar and songwriting (eight years in music biz and current band The Cartridge Family); mineralogy (dozens of articles published); numismatics (Adelphi U. certified); and of course, constitutional law and the Second Amendment. Alan, I love, love, love this newsletter…thank you for forwarding it to me! There is more factual information contained herein than the majority of the newspapers currently in circulation! What a great idea to educate, inform, and generally spread the word about guns, gun laws, right to bear arms and the Constitution all in one location. The current events, FAQs, tips, updates and the links are terrific... No one does it better than you Alan. Thanks for fighting the good fight and please know that you are valued and appreciated for all that you do. Please keep up the outstanding work and being eclectic is a “good thing” for your Page Nine readers! --Sincerely, Jean R.